No charge for members who have made their dues donation for the current year ending Dec. 31, 2018. When you’re driving to a new location, you don’t know how long it will take you to get there. Of course, you can use Google maps to discover the distance. Now, there are two ways to learn how long it usually takes at that hour on that day of the week! Since neither can account for accidents or other slowdowns, you should allow extra time. When you first pull up a map, it tells you what time you would arrive and what the traffic is like if you left now (black circle on blue field below:). You will get a dropdown menu with more choices! “Depart at” lets you learn the time you will arrive if you leave later. “Arrive by” lets you set it for the time you want to arrive, and it will tell you when you should leave. 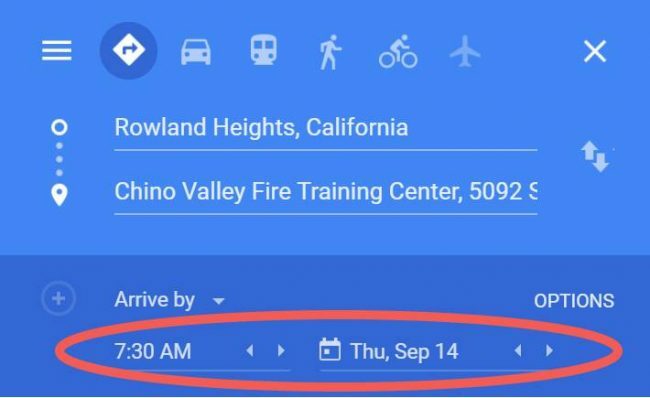 By clicking the arrows beside the time and the date, you can tell it exactly what day you’re going, and what time you want to arrive. Now, test it out by clicking on the map below and setting it to discover what time you will arrive at the Citrus Valley Medical Center—Queen of the Valley Campus, 1115 S. Sunset Avenue, West Covina on March 22.